The day we brought our daughter home from the hospital, still reeling from her miraculous adoption story, I marveled at her tiny size. I kissed every one of those miniature toes and was awestruck as her soft finger curled around mine. Yet those moments with my newborn were fleeting, as she grew quickly and blossomed before our eyes. The phrase, “She’ll never be smaller than she is today,” made this new mom tear up as I wished I could stop time. Fast forward almost seven years and my mother’s heart still aches knowing that my baby girl and her younger brother are growing up in the blink of an eye. 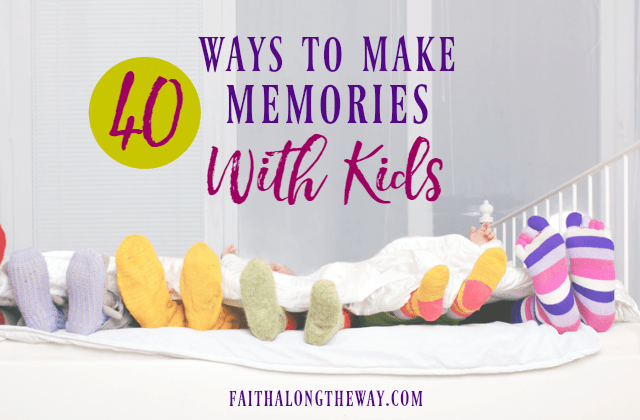 It’s amazing how quickly life passes, and we, as parents, must be intentional about making memories with our family. Just as with any solid relationship, a strong family foundation needs to be nurtured, fostered, and tended to with care and attention. When’s the last time you’ve been intentional about building into the life of your family? If you’re like me and this question makes me wrestle with a little “mom guilt” , lavish some grace upon yourself and start today intentionally making memories with your children by scheduling a monthly family date. Teach your kids to serve others and live generously like Jesus. Join our faith & family newsletter for instant access to the FREE Kindness Kit. It makes giving back as a family simple and practical! If you’re watching your pennies, alternate between an at home date and outings out in the community. You’ll find there is MUCH creative fun that can happen at home. 1. Create a backyard obstacle course. 2. Have a picnic either in your backyard or in a local park. 3. Make a tent or fort inside and spend the day playing in it as a family. 4. Make your own puppets and put on a puppet show. 5. Build a snowman. If you live a warm location, build mini-“sandmen” with kinetic sand. 6. Have a theme party, just for fun, and invite other friends to join the fun. 7. Using the FREE SkyView App on iTunes, point your iPad to the sky and learn which constellations are in your own backyard. 8. Build something together as a family, letting the kids use tools and paint your project if applicable. 9. Create a spa at home and take turns giving each other foot massages and back rubs. 10. Write a story together and have the kids create the illustrations. You can scan in the pictures and have the book published with Snapfish or another site that will publish a book pretty inexpensively. 11. Make a scrapbook together of your favorite family memories. 12. Plant and care for a garden together. 13. Bake some cookies and give them away to another family. 14. Create a family mailbox, where you write letters of encouragement and kind words to each other. 15. Fly a kite on a windy day. 16. Exercise together by taking up a family sport. 17. Take a hike around your neighborhood or on a local trail. 18. Go camping in the backyard, complete with a tent and s’mores. 19. Get a bird feeder, a book on birds, and record the birds you find in your own yard. 20. Have a cookie decorating contest, putting the pictures on social media to see which ones get the most votes. 2. Join an indoor swimming pool and enjoy swimming all year long. 3. Do a service project and volunteer to help others. 5. Find a local animal rescue and visit the sweet animals. Imagine what pet you would have if you were take one home. 6. Go on a scavenger hunt. Using local attractions, plan a day of fun, using clues to prompt to the next location. 9. Take a painting class where you can bring in your own snacks and drinks, all while being instructed to create the same painting. 10. Get to know the history of your state. Plan to visit historic places and learn about the events of the past that happened close to your home. 11. Kids plan a day for the parents! Give children a budget and have them surprise you with a fun activity. 12. Go geocaching and have an adventure close to home! Learn more about geocaching here. 13. Get dressed up and go out to a fancy dinner. Groupon makes fine dining affordable and the kids get to practice grown-up table manners. 14. Just for fun, spend the night in a hotel. 15. Expose the kids to culture and take them to a play, symphony, or ballet. 16. Go to a professional sporting event. 17. Tour some local businesses. We don’t live far from a Mayfield Dairy plant, and tours are inexpensive and fun. 18. Visit a farm and become farmers for a day. 19. As the weather warms, plan to attend local festivals and play games. 20. Run or walk a 5k together. How do you intentionally unite your family? Do you have family dates? I’d love to hear about your family’s favorite ways to stay connected! 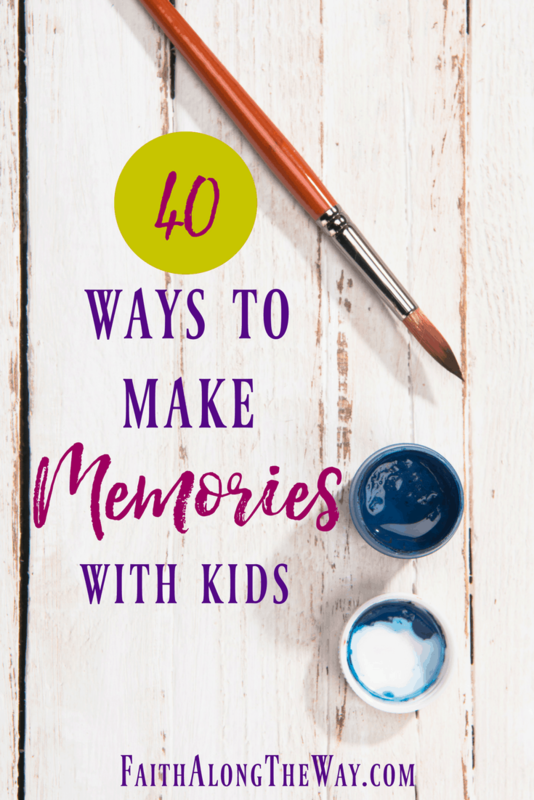 While I love the idea of intentional memory making as a family, sometimes parenting is just tough. My weary mom soul needed the encouragement in this week’s feature, 8 Powerful Tips on How to Love Your Kids When it’s Hard. Mari Eugenia from Inspired by Family shares a tough parenting moment and nuggets of truth she learned along the way. Are you a parent struggling with a difficult child? I am, and this post encouraged me right when I needed it most.